Featuring an in-built Wacom stylus and support for creative apps, will the recently revealed Google Chrome OS tablet become the new choice device for designers? Google went head-to-head with Apple yesterday as it launched the first tablet to run Chrome OS. 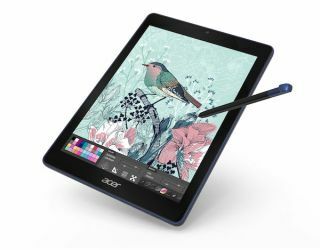 Pitched as a rival to the iPad, the Acer Chromebook Tab 10 was unveiled a day before Apple's Education Event in Chicago. Apple is expected to reveal its own affordable, education-focused tablet range at its imminent conference. Not one to be left behind, Google's Chrome OS-powered tablet goes toe-to-toe with its competitor on both performance and price. Just like the iPad, the Tab 10 boasts a 9.7-inch, 2048 x 1536 display. It also comes with cameras that face both the front and rear, an OP1 processor, 4GB of RAM and 32GB of storage. A USB-C port, headphone jack and microSD slot complete the package. With an estimated nine hours of battery life, the Tab 10 is perfectly suited to riding out a whole school day. One of the Tab 10's standout features is that it also has stylus support. This comes in the shape of a built-in Wacom EMR stylus that, unlike the Apple Pencil, doesn't require charging. It's a canny move, especially considering that the Tab 10 supports Adobe Illustrator Draw. Priced at just $329, the Tab 10 might be slightly more expensive than some Chromebooks, which tend to start at less than $300. For schools already used to working with Chrome OS that are after a tablet, this is still an attractive price. And it's also exactly the same price as Apple's most affordable iPad for consumers. Not one to be out done, Apple announced at its educational Field Trip event that the 2018 iPad will support the Apple Pencil. This is a major update for the line, as previously the iPad Pro was the only device that was compatible with the peripheral. The ability to use the Apple Pencil with an iPad makes the tablet a more desirable educational tool than the iPad Pro, and puts pressure on the Tab 10, especially considering that the educational market can snap them up for $299. As for the Tab 10, we can expect to see it roll out in North America during April, with a worldwide release lined up for May.